A couple of years ago I made a peppermint trifle for my family's Christmas Eve dinner. It was a big hit. This year my mom asked me to help her plan the menu. I suggested the trifle again but since I would be arriving mere hours before the party started she assigned my sister to make it instead. It was as delicious as I remembered so here's the recipe. Trifles are pretty and fun to assemble. Just remember to give yourself ample time to let things set and always use a "dry" cake. You never want to have something too moist with all that pudding and mousse. You'll also need a trifle bowl. If you want to make this a lot easier you could make boxed chocolate pudding since you'll need to make the cake and mousse from scratch. It won't be as tasty but it will be fine. Preheat the oven to 350 degrees. Coat a 9 inch round cake pan with cooking spray. Line the bottom with parchment paper and coat that with cooking spray as well. Bring milk and butter almost to a boil in a small saucepan. Remove from heat and set aside. Whisk flour, cocoa, baking powder and salt in a bowl. Put eggs in the bowl of an electric mixer with whisk and beat on high speed until pale and fluffy. Gradually add the sugar, beating until pale and thick, about 5 minutes. Add vanilla. Reduce speed to low and add hot milk mixture slowly. Add flour mixture and beat until combined. Pour batter into pan and bake until the center springs back when lightly touched (about 25 - 30 minutes). Let cool for 20 minutes before inverting onto a cooling rack. Remove parchment and let cool completely. Cut cake in half horizontally. Bring 1 cup cream just to a boil in a small saucepan. Place white chocolate chips in a bowl and pour in hot cream in a slow, steady stream while whisking. Transfer to a medium bowl set in ice-water bath. Let cool, stirring occasionally, until thick, about 15 minutes. Beat the remaining 1 1/2 cups cream to nearly stiff peaks. Fold into chocolate mixture, then fold in candies. Cover with plastic wrap, and refrigerate until thickened and almost firm, 4 to 6 hours. Put chocolate into a large bowl; set aside. Bring cream almost to a boil in a small saucepan. Whisk yolks in a bowl. Pour in hot cream in a slow, steady stream, whisking. Pour mixture back into pan. Cook over medium heat, stirring, until thick enough to coat the back of a spoon, about 1 minute. Pour through a fine sieve over chocolate; whisk until smooth. Set bowl in ice-water bath. Let cool, stirring occasionally, until thick enough to hold ribbons on surface, about 15 minutes. Place plastic wrap directly on surface; refrigerate until set, about 3 hours. 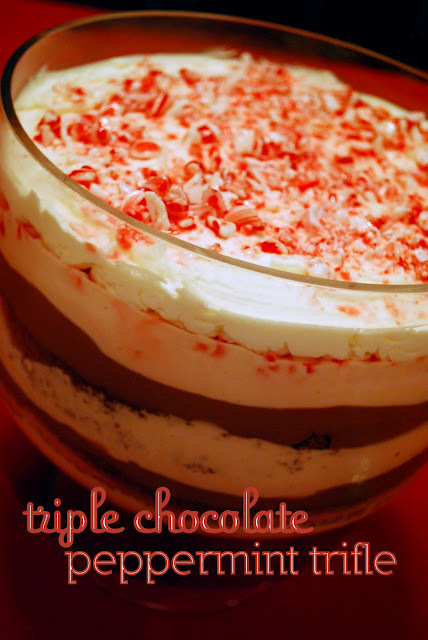 Spread one-third of the mousse into bottom of a glass trifle bowl that is 8 to 10 inches in diameter. Top with a cake layer. Top with half the pudding, then another third of mousse. Place remaining cake layer on top. Top with remaining pudding, then mousse. Cover with plastic wrap, and refrigerate 12 hours. Beat cream and sugar until soft peaks form. Top trifle with the whipped cream, and sprinkle with candies. I hate you for posting this! It sounds soo amazing! Hi Elizabeth...I just found your blog through a pinterest post. It's beautiful, and your culinary skills are impressive! I'm actually wondering if you are Liz who lived on fifth floor in T hall at BYU during summer 2002. I'm Lindsey Boice (now Wenzel), and I was the super tall one :) Just thought I'd say hi and see if my memory is right. Take care! Beautiful trifle. Maybe I'll make this at Christmas time. I had to laugh at the notion of dry cake because my mission in life is to stay away from dry cake. However, in this instance I'll be looking for dry cake. This took a little while to make, but absolutely delicious! Thanks for posting!